Serving as the medical director of a reproductive health clinic made Dr. George Tiller a lightning rod for constant vitriol — and more than once a target of violence. Picketers routinely gathered outside his clinic in Wichita, Kansas, a site of their protests because it provided abortions, including late-term abortions. In 1986, Tiller saw the clinic firebombed. Seven years later, in 1993, he suffered bullet wounds to his arms when an anti-abortion extremist fired on him outside the property. Finally, in 2009, he was fatally shot while attending worship services at a Wichita church. Anti-abortion extremists can create life-threatening scenarios for those who seek reproductive health care. In the wake of Dr. Tiller’s death, many reproductive rights advocates argued that his assassination could have been avoided. The shooting was not the first time his murderer, 51-year-old Scott Roeder, broke the law. Roeder could have been stopped prior to the shooting under a federal law, the Freedom of Access to Clinic Entrances (FACE) Act, which was enacted in 1994 — 19 years ago this Sunday — to protect the exercise of reproductive health choices. The FACE Act makes it a federal crime to intimidate or injure a person who is trying to access a reproductive health clinic. It also makes it unlawful to vandalize or otherwise intentionally damage a facility that provides reproductive health care. Roeder’s ideology was the root of his criminality. Roeder subscribed to a magazine, Prayer and Action News, that posited that killing abortion providers was “justifiable homicide.” Roeder also had ties to a right-wing extremist movement that claimed exemption from U.S. laws and the legal system. Members of the same movement had been involved in a three-month standoff with the FBI in 1996. Roeder’s extremism, though, didn’t stop at his views. Prior to murdering Dr. Tiller, he had threatened another abortion provider and vandalized both a Kansas City clinic and Dr. Tiller’s clinic. In 2007, someone identifying himself as Scott Roeder posted a message online that advocated confronting Dr. Tiller at his place of worship, Reformation Lutheran Church — the place where Roeder later carried out his assassination. The FACE Act was used aggressively during Clinton’s presidency. His administration prosecuted 17 defendants under the law in 1997 alone, and an average of 10 per year since the law was enacted. But in the years immediately prior to Dr. Tiller’s murder, under the George W. Bush administration, the legal climate had changed. “[W]e’ve heard that providers during that time would call [the Department of Justice] for help and get no response,” commented Janet Crepps of the Center for Reproductive Rights. According to Daphne Eviatar of Human Rights First, “under the Bush administration, criminal enforcement of the [FACE Act] had declined by more than 75 percent.” The drop-off in prosecutions wasn’t due to a lack of need. The National Abortion Federation, which compiles data on violence and disruption against abortion providers, documented more than 3,000 incidents of violence in the United States and Canada from 2000 to 2008. (Data for the United States alone is not available.) Reproductive rights advocates reported roughly the same number of incidents in the two decades prior to George W. Bush’s presidency. The department’s inaction against violators of the FACE Act can be explained by its makeup during the Bush years. As Eviatar reported in the last weeks of the Bush administration, “internal government reports and congressional hearings have documented [that] the Bush Justice Department over the last eight years expelled or ignored attorneys that it didn’t agree with and replaced them with inexperienced lawyers hired more for their ideology than their qualifications.” The Bush Justice Department had disqualified potential new hires if they had “liberal affiliations” — including connections to civil rights groups. Predictably, civil rights enforcement suffered, along with protection of patients and health care providers under the FACE Act. Thus, when Barack Obama took office in 2009, he inherited a Department of Justice staffed with people who lacked the will — and, in some cases, even the know-how — to enforce the FACE Act. Last month provided an ominous reminder of the need for continued vigilance. A new women’s health clinic, South Wind Women’s Center, opened in the same facility as Dr. Tiller’s former clinic. Anti-abortion extremists have already targeted the clinic — and its director, Julie Burkhart — with harassment and death threats. Burkhart, a former colleague of Tiller, filed a stalking protection order after one extremist appeared at her home with a sign reading “Where’s Your Church,” alluding to the circumstances of Tiller’s death. To continue protecting patients and providers, the FACE Act will need the kind of vigorous enforcement it has seen under Clinton and Obama. But some argue that the law itself needs careful revision, including stiffer penalties for violators. When the Government Accountability Office surveyed U.S. Attorney offices, respondents pointed to a need for “stiffer treatment under other applicable statutes.” Some respondents also saw a need for clarification over jurisdiction and the role of local authorities. To complement the federal law, California, New York, and Washington have passed state versions of the FACE Act, and other states have passed laws that deal more generally with harassment at health care facilities. Even when they stop short of violence, the actions of anti-abortion extremists can create life-threatening scenarios for women who seek reproductive health care. They can prevent or deter women from seeking the care they need — or send them toward unsafe providers. When the story of Kermit Gosnell and his illegal medical practices broke two years ago, a question it immediately spawned was what drove women to seek his services, most notoriously the abortion services that led to multiple murder charges — and convictions — in a two-month trial that ended last week. 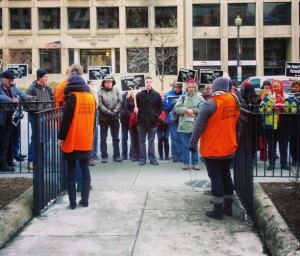 One patient who underwent an abortion at Gosnell’s clinic explained that she had first sought services at a Planned Parenthood health center in downtown Philadelphia, only to be scared away by the protesters outside: “The picketers out there, they just scared me half to death.” After entering Gosnell’s clinic, she says she immediately changed her mind when she saw another patient who was disoriented and surrounded by blood, but Gosnell allegedly restrained her and proceeded with the abortion. Protecting patients and providers is necessary not just for those under fire by extremists, but for virtually everyone. The fear that threats and violence induce isn’t confined to those directly targeted, and when that fear influences the career choices of providers and the personal choices of patients, health care suffers. Costs increase when facilities require repair, higher insurance, or increased security after vandalism or other attacks. Threats also impact the availability of services. The Guttmacher Institute, a research organization focused on reproductive health issues, reports that only 2 percent of abortion providers offer late-term abortions, the service most intensely targeted by anti-abortion extremists. One of those providers offering late-term abortions was Dr. Tiller’s clinic, which provided abortions past the 25th week of pregnancy. The new clinic opening in its space, according to its director Julie Burkhart, will not provide abortions past the 14th week of pregnancy. This entry was posted in Abortion, History and tagged abortion, ACLU of Arizona, American Civil Liberties Union, Anjali Abraham, anti-abortion, Arizona, Arizona Republic, arson, Associated Press, Barack Obama, Bill Clinton, California, Canada, Cathleen Mahoney, Center for Reproductive Rights, church, Civil Rights Division, Daphne Eviatar, David Gunn, defendant, Department of Justice, FACE Act, family planning, firebombing, Florida, Freedom of Access to Clinic Entrances Act, GAO, George Tiller, George W. Bush, Government Accountability Office, Guttmacher Institute, Humans Rights First, insurance, intimidation, Janet Crepps, Julie Burkhart, Kansas, Kansas City, Kermit Gosnell, late term abortion, murder, National Abortion Federation, New York, obstruction, Pennsylvania, Pensacola, Philadelphia, Planned Parenthood, Prayer and Action News, pregnancy, prosecution, Reformation Lutheran Church, reproductive freedom, reproductive health, reproductive rights, San Antonio, SB 1178, Scott Roeder, Senate Bill 1178, South Wind Women’s Center, Texas, U.S. Attorney, United States, vandalism, Washington, West Palm Beach, Wichita by Matt. Bookmark the permalink.